Edit: the photos disappeared. Sorry. 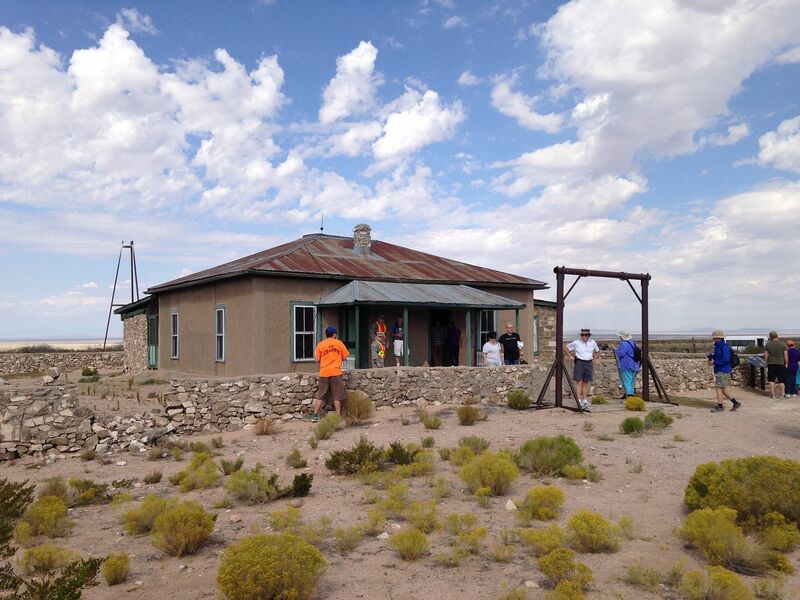 The first Saturday in October is one of two days a year in which you are allowed to visit the Trinity site; the location of the world's first Nuclear explosion. At just shy of 3 am I filled up and and Brenda and I headed for the Trinity site in New Mexico, a distance of just over 500 miles. The site is only open from 8 am to 2 pm and I had forgotten about the time change, so we really should have left around midnight but four hours of sleep is better than nothing when doing a ride like this. After riding through some 37 degree temperatures near Willcox AZ we stopped for breakfast in Lordsburg NM where it was a balmy 45 degrees. I had given Brenda her heated jacket and gloves because she gets cold at the drop of a hat, but I had failed to take my own gear thinking that it was only going to get down to about 47 degrees. Wrong! Big mistake! The lesson learned was to take the heated gear even if you don't think you're going to need it. I should have known better. From Lordburg we continued east to Las Cruces, got fuel to mark our corner, and then headed north to San Antonio NM. We obtained our fuel receipt from the town's single dual-hose pump (pay inside only) and then headed for the White Sands Missile Range entrance about 12 miles east of San Antonio. From there you ride about 5 miles south to the range (Stallion) gate where you are given the once-over and everyone's ID is checked. We then proceeded to the Trinity site via a paved two lane (rough) road. There is a sign just inside the gate entrance that says radar detectors are prohibited, but the guards either didn't notice mine or didn't care. The base is also a No Firearms area but again, they never asked about it. You can take pictures at the Trinity site but nowhere else on the base. If I had been in a cage I would have been shooting photos left and right, but it's a bit obvious when you're on a bike so I behaved myself. The sign about the radar detector is pointless because mine was falseing on K and Ka bands the entire time I was on the base and even 5 miles away from the base. There are radar installations *everywhere* you look, especially on the north side of the facility, but they are up on the mountain peaks as well. After about 20 miles of rough pavement you arrive at the gravel parking lot and they gave motorcycles preferential treatment near the site entrance which was really nice of them. The entrance is just behind me to the right, and you can see the Wing on the other side of the Trinity sign. There are porta-pottys and some water coolers provided, but that's the extent of the "services". Since it's a 1/4 mile walk to the actual test site from the parking lot we were very fortunate that they did provide a golf cart for disabled folks, as I doubt that Brenda would have been able to make the entire trip. Once you're at the site you discover that the ground around the tower for about 300 feet was depressed up to 8 feet by the detonation. The area took on the shape of a dinner plate; sunken in the center with a raised edge. There is a small clump of concrete/rebar above the surface which is what remained of one of the tower legs. Everything else was vaporized. The bomb had been in a shelter at the top of the 100 foot high tower when detonated. Just like at the Four Corners monument, everyone waits their turn to get their photo taken at the monument itself. The entire area is still radioactive, but a couple of hours spent there will not affect you all that much. Still, they do have signage to let you know that your being there is at your own risk. Since we had arrived so late we did not have time to visit the McDonald House, a tour that requires you taking one of their shuttle buses to get there. The Balloon Festival was going on this same weekend, so if it plays out again the same way next year we'll probably make a long weekend of it and visit ABQ first for the balloons, and then come down to Trinity earlier in the morning on Saturday for the full tour. We mounted back up and headed home, stopping in Truth or Consequences for dinner and fuel, and then back through Las Cruces and Lordsburg before reaching home just prior to midnight. Total odo miles was just under 1150, and total GPS miles was 1097. Time was just a few minutes shy of 21 hours. Brenda's stroke anniversary is this coming Monday morning, so this was very much a celebration of her recovery from four years ago. From not knowing who I was, or who her son was, to not knowing her name, not being able to walk or talk or read or eat; to being able to ride a SaddleSore 1000 after only being back on the bike for six months is remarkable. After the stroke I didn't touch the bike for three and a half years as her rehab took most of the first six months and then she continued recovery beyond that. This past March she indicated that she wanted to try riding again, so we started with some small 1-2 hour rides and then progressed into half days, and then into full days, and then into Tour Of Honor site chasing days throughout Arizona and New Mexico. My original intention had been for me to go on this ride alone, but at the last minute she asked to go as well, so after some serious discussion about how hard this would be she still wanted to do it. She stayed awake the entire time which is more than I can say for some of our prior SaddleSores in the past. She was very tired and sore and slept almost 24 hours over the next two days, but that's to be expected. Stroke survivors are known to have a lower level of stamina after the event. All in all, although poorly planned it was a good ride with a good result. Nicely documented - congrats to both you and Brenda! Great report. Kudos to you both. The ride and Brenda's recovery/resolve is truly inspiring - thanks for sharing with us Brian. Definitely a trip I would like to take in the future. April 7, 2018 looks like the next opportunity to do this...first Sat in April & October. Well done to you both, how significant to rack up a ride like this together. That is definitely on the agenda for the next trip. April might still be a bit cool in the higher elevations so I think I'll wait for next October and see if I can tie the Balloon Festival into it. Congratulations! I was at Trinity in April this year! A trip that I've wanted to do for a very long time! I saw a few bikes there that day and it made me sad that I couldn't have rode down from SLC, due to snowstorm that was predicted and came true in the Gallup area. The rest of the trip was great though! Certificate arrived today. Michael, thank you for approving this. Mike announced yesterday in a FB post that this is on for next year. I know they'll be working on the rules over the winter but he told folks to start planning their April rides now. Maybe I'll do it again just to see who shows up. Nice! That'll be one to do for sure! Great inspirational story. Love the certificate! My FB history only goes back to the 22nd and Mike posted on the 21st (I think). It would have been on one of the LD riding pages but I just don't remember which one. For those of you planning to do this next April, I just confirmed with the San Antonio General Store (the only place in town with fuel) that they will be open their normal hours on that Saturday of 7 am - 7 pm. Group ride from Phoenix? I would add some places up north of ABQ that have to do with this and lots of research applied today in many engineering fields.